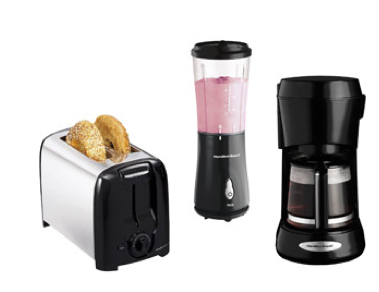 Hamilton Beach Toaster, Blender + Coffee Maker Bundle $34.88 ( = $11.63 each)! You are here: Home / Great Deals / Hamilton Beach Toaster, Blender + Coffee Maker Bundle $34.88 ( = $11.63 each)! This would make a super nice housewarming gift, or nice little guilt-free splurge if you need new kitchen gadgets! You can currently snag this Hamilton Beach Toaster, Blender + Coffee Maker Bundle for only $34.88 – That makes each one only $11.63! PLUS, you can get FREE shipping when you select Site-to-Store shipping!